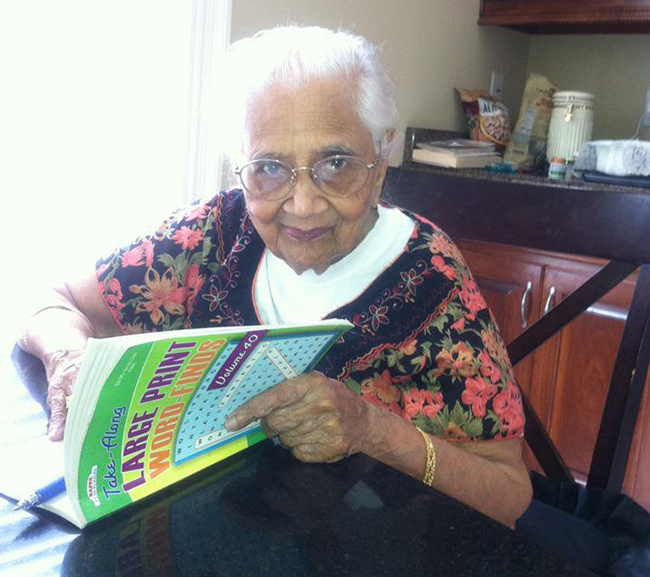 Atlanta, GA, December 29: Atlanta’s oldest Indian-American resident, Alamelu Srinivasan, has passed away. She was 103. Alamelu Amma, as she was fondly called, was a native of Kancheepuram, Tamil Nadu and a resident of USA for over 40 years. She passed away on Wednesday December 28 at Norman, Oklahoma. Her children were by her side at the time of her demise. Amma, who grew up in Myanmar (Burma), was one of the few Indian women who graduated from college in the 1930s. She later worked at the Kancheepuram Government Girls High School and was an educationalist for 60 years. She is survived by her children Dr. Kamala Radhakrishnan, Srinivasan Rajappa, Dr. Ekambaram Rajappa and Atlanta’s Dr. Paddy Sharma, and several grandchildren and great grandchildren. Alamelu Amma was featured in Indians of Atlanta, a blog and Facebook community maintained by NRI Pulse Newspaper in 2015. Her narrative (reproduced below) quickly went viral. “I turned 102 on August 4. My blood pressure is normal. I have no diabetes. I still walk with a walker. I am in good health because I keep my brain active. I do math and crossword puzzles every single day. I speak four languages- Tamil, Telugu, Sanskrit and English- and make it a point to write in those languages everyday so I don’t lose them. I ask visitors to our home if they have any special prayers, and write the prayers 108 times in their name. I was born in 1913 in Rangoon,Burma, the 9th child of my parents. My father was a chartered accountant. I was interested in litigation at a young age and my father wanted me to be a lawyer. But my brothers felt I was too outspoken and abrupt to be in law. So I got a BA and MA in English literature, then a B.Ed. I ended up becoming an educator. I was married off to this charming would-be doctor in Rangoon when I was just 13, but my father made sure I stayed on with them until I completed my post-graduation. Only then was I allowed to start a family. I was 22 when my first daughter was born. Amma will forever be remembered as an inspiration by the Atlanta community.